Since the visual turn in the social sciences at the beginning of the twenty-first century, images have become important points of engagement both as objects and as modes of analysis. For this reason, along with its 50+ entries exploring the keywords used by contemporary activists, Keywords for Radicals (AK Press 2016) incorporates data visualization to show how the “vocabulary” shared by radicals constitutes a kind of self-supporting small world network. Such visualizations can help readers to map how the project’s vocabulary “works” and how struggles over word usage and meaning might most effectively be carried out. But while data visualization of this kind can be useful, it also raises significant epistemological questions about the relationship between representation and what’s real. 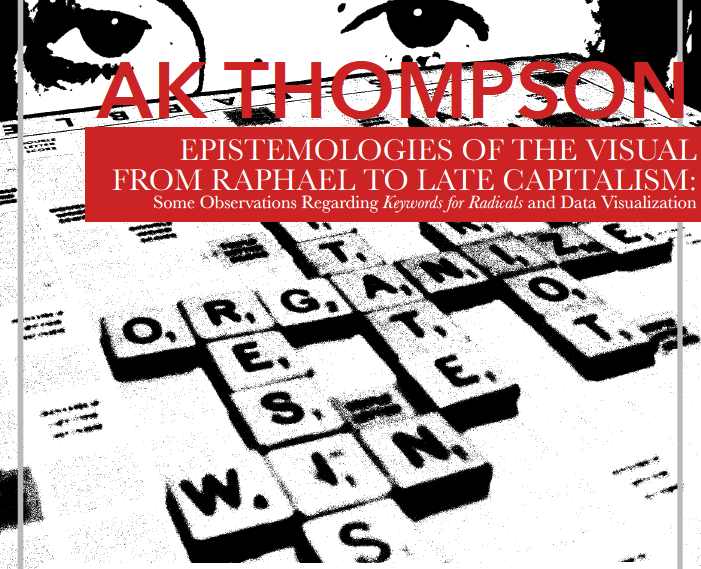 AK Thompson got kicked out of high school for publishing an underground newspaper called The Agitator and has been an activist, writer, and social theorist ever since. Currently teaching social theory at Fordham University, his publications include Black Bloc, White Riot: Anti-Globalization and the Genealogy of Dissent (2010) and Sociology for Changing the World: Social Movements/Social Research (2006). Between 2005 and 2012, he served on the Editorial Committee of Upping The Anti: A Journal of Theory and Action. A speaker series jointly hosted by Feminist Studies & the History of Consciousness, with support from the Center for Cultural Studies.